What makes a good indexing system? Is indexing by the author or editor a valuable alternative? What can be expected of automatic text indexing? Why index moving images automatically? What are taxonomies and what are they used for? Are Topic Maps the future of indexing? Is it possible to index the web? What about indexing the ‘deep web’? Indexing consists of both novel and more traditional techniques. Cutting-edge indexing techniques, such as automatic indexing, ontologies, and topic maps, were developed independently of older techniques such as thesauri, but it is now recognized that these older methods also hold expertise. 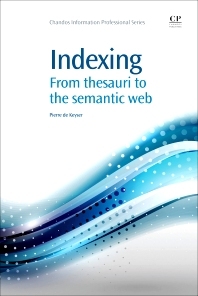 Indexing describes various traditional and novel indexing techniques, giving information professionals and students of library and information sciences a broad and comprehensible introduction to indexing. This title consists of twelve chapters: an Introduction to subject readings and theasauri; Automatic indexing versus manual indexing; Techniques applied in automatic indexing of text material; Automatic indexing of images; The black art of indexing moving images; Automatic indexing of music; Taxonomies and ontologies; Metadata formats and indexing; Tagging; Topic maps; Indexing the web; and The Semantic Web. Piet de Keyser is head librarian of the Katholieke Hogeschool Leuven, an institute for higher education in Louvain, Belgium. He published many articles on literary history, philosophy and library sciences. He teaches indexing in a Belgian Library and Information Sciences school.